高佳佳, 黄晓清, 尼玛吉, 2018. 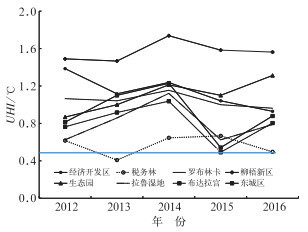 2012—2016年拉萨市热岛效应的时空分布及对土地利用/覆盖的响应[J]. 气象, 44(7): 936-943. DOI: 10.7519/j.issn.1000-0526.2018.07.009. GAO Jiajia, HUANG Xiaoqing, NI Maji, 2018. Spatio-Temporal Distribution of Heat Island Effect in Lhasa and Its Response to Land-Use/Cover in 2012-2016[J]. Meteorological Monthly, 44(7): 936-943. DOI: 10.7519/j.issn.1000-0526.2018.07.009. Abstract: This paper uses the conventional observation data collected from eight automatic weather stations in Lhasa in 2012-2016, and the related data of local industry, agriculture and residents' living status, and assesses the spatio-temporal distribution of heat island effect in Lhasa and its relationship with land-use. The results show that the annual and seasonal changes of urban heat island in Lhasa are gradually increasing. The monthly variation of the urban heat island intensity is mainly concentrated in winter, followed by summer, and the heat island effects in spring and autumn are weak. The spatial distribution of the urban heat island is extremely uneven: high in the southwest and low in the northeast. Heat island area has expanded, and the center shifts southward from the economic development zone to the Liuwu Railway Station, with low value range located near the Tax Forest and the Lalu Wetland. 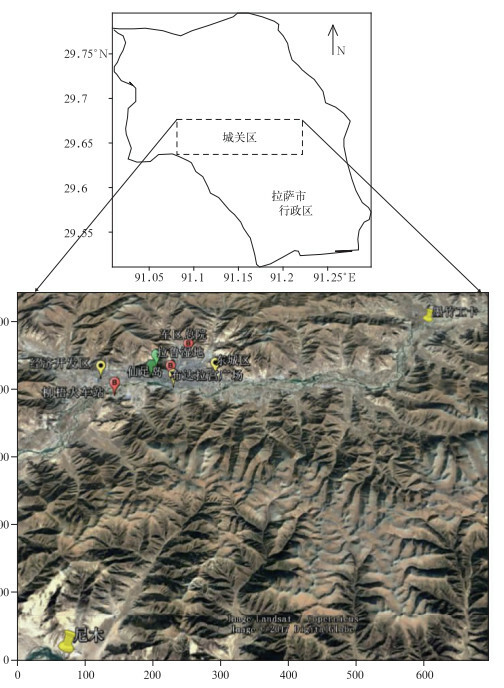 The heat island intensity of Lhasa is positively correlated to population density, housing built area and reduced cultivated land area, and negatively correlated to afforestation area. It has no significant correlation with agricultural production. 白丽月, 2017. 福州城市热岛效应与土地利用变化关系研究[J]. 中国国土资源经济, 30(1): 39-43. 陈康林, 龚建周, 陈晓越, 2017. 广州市热岛强度的空间格局及其分异特征[J]. 生态学杂志, 36(3): 792-799. 陈松, 房稳静, 方向明, 等, 2012. 驻马店市城市热岛效应特征及对空气污染的影响[C]//第29届中国气象学会年会论文集. 沈阳: 中国气象学会: 6. 除多, 张镱锂, 郑度, 2006. 拉萨地区土地利用变化[J]. 地理学报, 61(10): 1075-1083. 党青, 杨武年, 2010. 成都市土地利用类型对城区热岛效应的影响[C]//2010届国际遥感会议录. 杭州: 电器和电子工程师学会电气和电子工程师协会. 宫阿都, 陈云浩, 李京, 等, 2007. 北京市城市热岛与土地利用/覆盖变化的关系研究[J]. 中国图象图形学报, 12(8): 1476-1482. 何萍, 李矜霄, 矣永正, 等, 2016. 城市化对云南高原楚雄市近年来城市热岛效应影响研究[J]. 干旱区地理, 39(4): 687-694. 胡祖恒, 徐忠峰, 马柱国, 2017. 北半球温室气体和土地利用/覆盖变化对地面气温日较差的影响[J]. 气象, 43(12): 1453-1460. 拉巴次仁, 卓嘎, 罗布, 等, 2012. 拉萨市城市热岛的时空分布特征[J]. 资源科学, 34(12): 2364-2373. 拉萨市统计局, 国家统计局拉萨调查队, 2015. 拉萨市统计年鉴-2015[M]. 拉萨: 拉萨市统计局. 李国栋, 张俊华, 赵自胜, 等, 2013. 典型河谷型城市冬季热场分布和热岛效应特征及其驱动机制研究——以兰州市为例[J]. 资源科学, 35(7): 1463-1473. 李恒凯, 阮永俭, 杨柳, 等, 2017. 中小城市城区扩张的热效应演变及响应[J]. 测绘科学, 42(2): 71-77, 83. 梁益同, 陈正洪, 夏智宏, 2010. 基于RS和GIS的武汉城市热岛效应年代演变及其机理分析[J]. 长江流域资源与环境, 19(8): 914-918. 林学椿, 于淑秋, 唐国利, 2005. 北京城市化进程与热岛强度关系的研究[J]. 自然科学进展, 15(7): 882-886. 刘剋, 顾行发, 余涛, 等, 2011. 城市台站周边热岛效应和土地利用与覆被变化关系[J]. 气候与环境研究, 16(6): 707-716. 刘学锋, 阮新, 谷永利, 2005. 石家庄地区气温变化和热岛效应分析[J]. 环境科学研究, 18(5): 11-14. 罗茜, 2010. 北京城市生态环境建设与城市热岛效应[C]//2010"北京园林绿化"学术研讨会论文集. 北京: 北京园林学会: 5. 屈益挺, 孟丹, 李小娟, 2017. 北京市城市扩张及其对城市增温效应的影响[J]. 首都师范大学学报(自然科学版), 38(2): 77-83. 宋善允, 王鹏祥, 杜军, 等, 2013. 西藏气候[M]. 北京: 气象出版社. 孙继松, 舒文军, 2007. 北京城市热岛效应对冬夏季降水的影响研究[J]. 大气科学, 31(2): 311-320. 王荣华, 2008. 京津冀都市圈植被覆盖和城市热岛时空变化特征分析[D]. 北京: 首都师范大学. 王咏薇, 任侠, 翟雪飞, 等, 2016. 南京复杂下垫面条件下的三维城市热环境模拟[J]. 大气科学学报, 39(4): 525-535. 魏凤英, 1999. 现代气候统计诊断与预测技术[M]. 北京: 气象出版社. 魏凤英, 2007. 现代气候统计诊断与预测技术:第2版[M]. 北京: 气象出版社. 肖荣波, 欧阳志云, 李伟峰, 等, 2005. 城市热岛的生态环境效应[J]. 生态学报, 25(8). 杨春华, 雷波, 张晟, 2013. 重庆市主城区热岛效应与植被覆盖关系研究[J]. 人民长江, 44(7): 51-55. 杨英宝, 苏伟忠, 江南, 等, 2007. 南京市热岛效应变化时空特征及其与土地利用变化的关系[J]. 地理研究, 26(5): 877-886. 余永江, 林长城, 王宏, 等, 2009. 福建省福州城市热岛效应与气象条件的关系研究[J]. 安徽农业科学, 37(3): 1165-1166, 1174. 周明煜, 曲绍厚, 李玉英, 等, 1980. 北京地区热岛和热岛环流特征[J]. 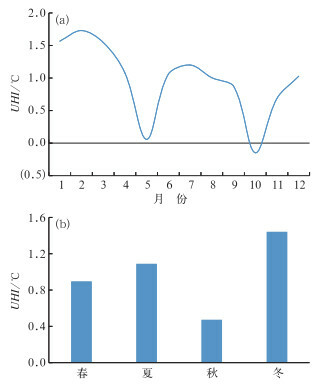 环境科学, 1(5): 12-18. 卓嘎, 普布次仁, 刘伟东, 2010. 西藏拉萨市热岛效应及其影响因子分析[J]. 中国环境监测, 26(4): 59-67. Bhati S, Mohan M, 2016. WRF model evaluation for the urban heat island assessment under varying land use/land cover and reference site conditions[J]. Theoret Appl Climatol, 126(1/2): 385-400. Oke T R, 1987. Boundary Layer Climates[M]. 2nd ed. London: Routledge.